Today Koh Ker is only a small village within the northern part of the vast excavation area of the ancient Chok Gargyar, which is the second largest Khmer temple town and was the capital of the empire between 928 and 944. Koh Ker is located 110 km north-east of Siem Reap, parts of the road are paved. The road condition between Siem Reap and Beng Mealea, which is halfway, is not too bad, but the second half of the road, between Beng Mealea and Koh Ker, allows only slow driving, there are many potholes. The road shall be improved in the near future. Until now, you should estimate altogether three hours and a half or even four hours including some short breaks for a taxi tour to Koh Ker. Until now there is no public transport service. The road leads through one of the poorest and very remote regions of Cambodia. The forests were under Khmer rouge control during the civil war. Due to illegal logging it looks a little bit more like scrubland now, the virgin forest is in a very poor condition. Parts of the road leading to Beng Mealea are picturesque and cross typical Cambodian villages and farmland. Close to Koh Ker there is only hostel style accommodation. Camping is not permitted in the excavation area. In about 8 km distance Mon Morokod Koh Ker Guest House has western toilets and running water and electricity for some hours in the evening. It has a good restaurant, too. The guest house is on the access road to the temples, in the outskirts of Srayang. The next 3-star hotel is in 70 km distance in the provincial capital now called Preah Vihear (City), formerly known as and on maps still called Tbaeng Meanchey. It is on the way from Koh Ker to Phnom Penh, which is in more than 400 km distance from Preah Vihear. 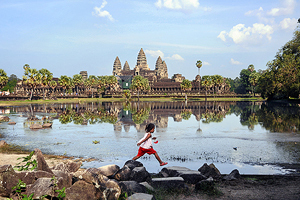 The Cambodian government is eager to develop a tourist infrastructure in this underdeveloped part of the country, with the help of foreign investors. So not only road conditions but also accommodation and other facilities may change in the near future. But until now Koh Ker is completely untouched by mass tourism, only very few bus journey reach Koh Ker, most visitors are here on private motorbike or taxi tours starting from Siem Reap where you have the best choice of accommodation, ranging from dormitories till high-end luxury hotels. There are only few restaurants and shops in Koh Ker, they are located at the main car park in front of the biggest temple complex called Prasat Thom. They are only shacks and offer local food. Hot noodle soup and rice dishes are available. Soft drinks are from boxes cooled with ice. There are some more Khmer restaurants and cafes in the village Sray Yong 10 km further south. You can visit about two two dozen temples and basins in Koh Ker, most of them are close to a ring road surrounding the former reservoir called Rahal Baray. 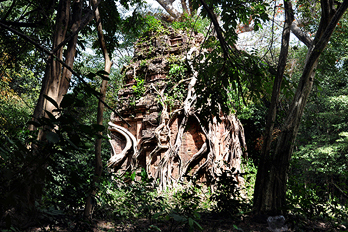 There are remnans of many more temples in the vicinity, altogether more than 180 structures, but you can not reach them because the vicinity is not safe, Koh Ker is located in the centre of the former civil war zone and not yet entirely free from landmines. But don’t worry, the most interesting temples, those along the ring road, are safe now, due to the international help. There are boards at the access pathes to nearly all the important temples, they are easy to find. In those yet unexplored areas there are only very small ruins, many of the locations are only known from satellite images. The entrance fee is 10 US Dollars, it is payable at a booth in 7 km distance from Prasat Thom. Tickets are sold by the Kham Samet Company that built the road to Koh Ker. 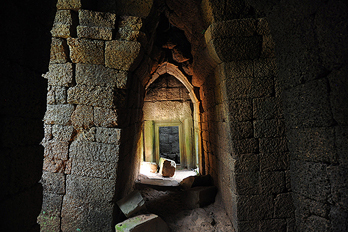 The entrance for Beng Mealea is 10 US Dollars, too. Now other currency than US Dollars is accepted for entrance tickets all over Cambodia. 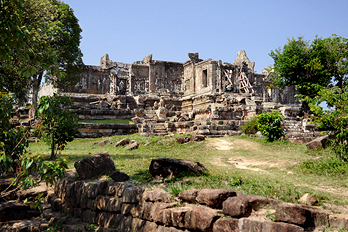 Locals can arrange an oxcart ride around the temples. Until now there is no electric current in Koh Ker! Thus you cannot charge your cameras or computers here. In about 8 km distqnce Mon Morokod Koh Ker Guest House has electricity for some hours in the evening. Don’t leave the core zone along the ring road, even if there are no ‘Danger Mines’ boards the landmine risk is high in the vicinity of Koh Ker. Malaria protection, which is not needed in Siem Reap at Angkor, is essential when visiting Koh Ker. Be aware, this border region to Thailand is the origin of the most dangerous form of Malaria at all, there is no medical help available for this infection. This drug-resistant kind of Plasmodium falciporum is resilient even to artemisinin-based combined therapies (ABT), the most effective antimalarial treatment. Nevertheless, prophylaxis is not in vain against other kinds of tropical Malaria also occuring here. But if you are only on a day trip, using medicinal Malaria prophylaxe is not recommendable. Why not? 1. For an effective protection you would have to start taking this medicine one week in advance and continue to take it two weeks more after leaving the dangerous zone. But taking medicine three weeks for only one day-trip can cause other deseases because of side effect. Better you only have stand-by medicine ready. 2. Inaccurate use of antimalerial drugs can contribute to spreading resistances. 3. Your prophylaxe could give you a completely wrong feeling of being protected and dispose you to be less careful regarding more effective methods of protection, namely clothing and repellents. Indeed, whatever medicine you take, even Lariam, can be effectless because of the different forms of malaria in this area. 4. What you really need for a good protection is chemical mosquito repellents. Use them already halfway to Koh Ker and use them several times a day. Most important is you use them behind your ears and at your ankles between shoes and trousers, even on socks. It is a rule of politeness to wear long trousers in temple areas anyway, but it is highly recommendable for your protection against malaria, too. Long sleeves are even better. Another important advice: You should buy your repellents only in Cambodian pharmacies or supermarkets, because those repellents from your home country are not developed to protect against Cambodian mosquitos. 5. On a daytrip from Siem Reap you will not stay in the malaria zone in the morning or evening, the risk of mosquito bites is low during daytime hours. In the dry season, which is touristic high season, there are almost no mosquito bite risks. 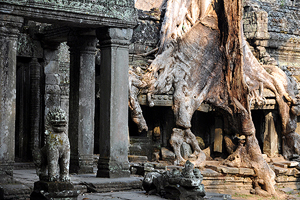 Most of the following travel information about Cambodia in general and Siem Reap and Angkor in particular is cited from the websites www.angkor-temples.com and www.angkor-travels.com. You do not need Cambodian currency in Cambodia. You really do not need it! Never change US-Dollars at the border for local currency! Don’t trust international pocket guidebooks in this respect. You can be 100% sure: The only currency you need inside Cambodia is US Dollars. Every Cambodian uses US Dollars, really everyone. There is not one single guesthouse or chauffeur or shop or even shack in any corner of Cambodia that does not accept US Dollars. Every bill in Cambodia is issued in US Dollars, only in US Dollars. So let’s hope, this is clear enough now - though most tourists do not believe it in advance and still try to change and receive Cambodian currency after crossing the border. But better don’t do this, you only lose value of your money. Cambodians only use their own currency instead of US cents, so you will get it in shops and restaurants simply as change instead of cents. And you will soon try to get rid of all the almost worthless paper money in your wallet and will like to have only the Dollars left. All visitors, except citizens of Indonesia, Malaysia, Singapore, Philippines, Laos, Thailand and Vietnam need a visa to enter Cambodia. A passport valid for a minimum of six months beyond the date of entry into Cambodia with at least one completely blank visa page remaining, plus two passport-sized (4cm by 6cm) photographs, are required to apply for a visa. It can be issued on arrival at the international airports and at all major border crossings. Cambodia offers on-line visa processing, too, on the Ministry of Foreign Affairs and International Cooperation website. But E-Visas are only valid for entry by air or at the three border main land crossings only: Bavet (on the Ho Chi Minh City-Phnom Penh road); Koh Kong (near Trat in Eastern Thailand); and Poipet (on the Bangkok-Siem Reap road).You may also apply in person at a Cambodian Embassy or Consulate. 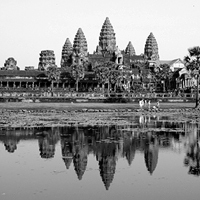 Tourist visas are valid for one month beginning with the date of entry into Cambodia. Those issued in advance expire 90 days after issue. The official price for a tourist visa is US$20, US$25 for a tourist e-visa, US$25 for an "ordinary visa" also known more commonly as "business visa" or "Visa-E". The major difference between a tourist and an ordinary visa is that a tourist visa can only be extended once, for maximum 2 months of stay in Cambodia, whereas an ordinary (business) visa can be extended for extended periods up to a year and more. Onlöy ordinary visas have multiple entry status when and only when extended. Cambodia imposes fines for overstay of an expired visa. If the overstay is 30 days or less, the charge is USD $5.00 per day; for overstays of more than 30 days, the charge is USD $6.00 per day. Adult visitors are allowed to bring into Cambodia 200 cigarettes or the equivalent amount of tobacco, and one opened bottle of liquor and perfume for personal use. It is advisable to contact the Embassy of Cambodia for specific information regarding customs requirements. It is illegal to export original antiques or artefacts from ancient sites. Cambodia is a tropical country. Like other countries in South and Southeast Asia its climate is characterized by the monsoons of the Indian ocean. So there are only two seasons, rainy season and dry season. The southwest monsoon brings the rainy season from mid-May to mid-September or to early October. This is off-season in the tourism sector. Though heavy rainfalls are unavoidable when visiting Cambodia a week or two during these months, there are sunshine hours almost every day, sometimes even a perfectly blue sky, as rain showers are usually heavy, but not lasting. And there are even advantages to visit our country during the monsoon season, besides better hotel rats. The water levels are high, and the scenery becomes green, you have better chances to enjoy monuments in tranquility. You should be aware, that there are often heavy floods in Cambodia in September or October, approximately every second year. The floods are not only caused by monsoon precipitation, but due to the cyclone season at the South China Sea. 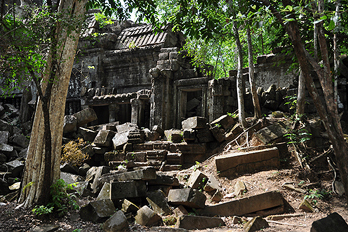 Though the storms inside Cambodia are less devastating than along the coasts of neighbouring Vietnam, some Angkor areas can become rather muddy und uncomfortable and some remote destinations even inaccessible. Occasionally, even the main road (NR6) connecting Siem Reap with the capital Phnom Penh, can be closed for public and private transport. 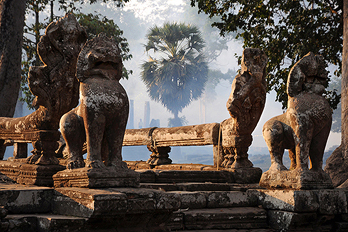 The best time to visit Angkor is from mid of November to February. Rainfall can occur, but usually you have sunshine every day. The country is still pleasantly green. The winds from the northeast are dry and comparatively cool. January is the collest month. 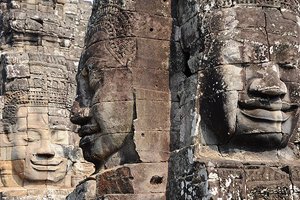 Of course, this is highseason, most tourists prefer to visit Cambodia during these months. In March and April sunshine hours still prevail, but the the land becomes dry and the air dusty. I can be extemely hot during these months. April is the warmest month in Cambodia. Temperatures can rise to 38 degrees centigrade and more. Nevertheless, April is still touristic high season, partly due to Easter Holidays in Western countries. Similar to other tropical countries, the relative humidity is high throughout the year, usually exceeding 90 percent at nighttime and about 50 percent during daytime hours. Siem Reap offers a wide range of restaurants, Western food, Chinese food and Indian food is available. Two kinds of restaurants are quite popular among both foreign guests and Cambodian locals. Cambodians love BBQ food. And many restaurants introduced a buffet system, with a kind of Mongolian firepot at your table. At buffet restaurants, the variety of meat and fish is huge. Additionally, there is a variety cheap street food available, too, soups, baguette sandwiches, or fried noodles. Baguette (Nom Pang) is a French legacy, of course. It is quite popular, particularly with slices of ham or grilled meats, vegetables and chilly paste. Many street sellers offer fresh fruits for a reasonable price, pineapple, mango, melon and papaya are most popular. They are also sold at parking lots in front of Angkor temples. Durian, mangosteen and sapodilla are in high regard. Fresh coconut can be found everywhere. In local restaurants you can get a meal for less than a US dollar, for example, you can have a tasty and healthy and filling breakfast. In the morning, Cambodians prefer to eat soup, with so-called Chinese or with instant noodles. Alternatively, there is served a porridge, but not in the Western style. Khmer food is less spicy than Thai food. Black pepper is preferred over chillis. Cambodians love sour tastes in their dishes. Preserved lemons are used in many Khmer dishes to enhance the sourness. Khmer sometimes sweeten soups and other salty dishes, but the use of sugar is less widespread than Thailand. Being a tourist hub, there are a many shopping opportunities in Siem Reap. The most famous one is the Old Market right in the city centre. There are lots of souvenir stalls for tourists now, but eating in the restaurants here is still less expensive than in the nearby Pub Street. The core area of the roofed Old Market remains to be a place mainly frequented by locals buying fresh food. The largest local market is at the National Road Nr. 6 about 2 km away from the town centre. The Angkor Night Market was founded in 2007. It was the first night market in Cambodia. Its mission is to preserve traditional Khmer handicrafts, to create jobs for locals and please the demands of foreign guests. Contuously, the number of 100 hut-style stalls in the beginning has increased to 250. The main selling items are shirts and other cloths, bracelets, scarfs, bags, silk paintings, handmade statues, replicas of ancient sculptures and intricate wooden boxes and other wood and stone carvings. 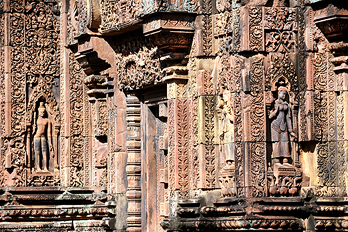 Carvings are often used for ornamentation and furniture in Cambodia. Another handicraft nightmarket was opened in 2011 at the left riverbank, just opposite to the Old Market. The traditional respectful way of greeting one another is to bow the head slightly with hands pressed together at the chest. This gesture known as “Sampeah” is not expected from guests from Western countries. Handshake is not common in Cambodia, but will not be refused. Ask for permission before taking photographs of locals, particularly of monks. In tourist areas you will be often asked if you like to have a Tuktuk, massage, or a look inside a shop. This may be enerving it if occurs every few minutes. But respect each individual by giving a polite answer. Only in cases of obvious pestering let them feel that you feel disturbed. Particularly at the big Angkor temples, there are children selling postcards, shirts and souvenirs who will ask repeatedly if you want to buy something and will follow you even after you refused. The best way to react is to tell them that they should accept your decision not to buy anything. 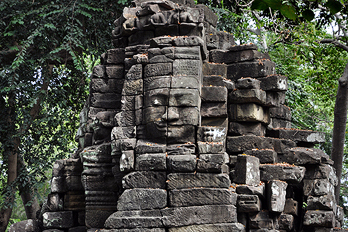 Be aware, at some smaller Angkor temples there are school children who seem to play or relax. Actually, they are waiting for tourists and will ask for a dollar for school books or support after a small conversation. Usually they start asking you, what is your country. Then they will answer you by naming the capital of your country in order to pretend some intimacy. They will give you explanations, but they will not forget to ask for a dollar as a reward. It is customary to remove your hats or caps when entering a compund of a monastery or pagoda or temple, already outside the buildings. But this is not required at ancient monuments. The dress should be appropriate, particularly shoulders should be thighs should be covered. It is obligatory to remove shoes when entering a room inside a place of worship. It is respectful to remove shoes when entering someone’s home. Many Cambodians will kindly signal you that they accept an exception from the rule for you as a guest. On the other hand, even some guesthouses ask their guests to remove shoes before entering the corridors. If invited to a Cambodian family’s home privately, it is polite to bring a small gift for the host, such as flowers, fruit, or sweets. If invited to attend a Cambodian wedding, guests bring cash as a wedding gift. Don't begin eating if you are a guest as long as the host has yet to take a bite. When using a toothpick at the table, usually provided in restaurants, use one hand to cover your mouth. Present and accept gifts and business cards with both hands. For handing out money, better use the right hand. Never use your feet to point at someone. Never show your soles of the feet to a Buddha statue. When sitting on the ground, what is customary in Cambodian houses, do not stretch your feet out to persons or altars. Don't touch a local person on the head. Don't touch monks, even avoid handshakes if not offered by them. Women should not hand out gifts directly to a monk. 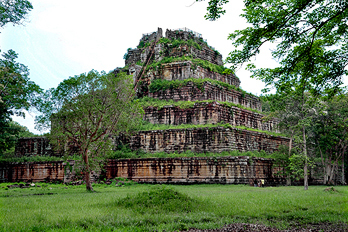 Koh Ker belongs to Preah Vihear Province in northern Cambodia. The length of the road from Siem Reap to Koh Ker is 110 km. As the crow flies, Koh Ker is located 80 km north-east of Angkor. The most important ancient Khmer road, connecting Angkor with modern Annam at the South China Sea, crossed Beng Mealea and Koh Ker.